Caronport is a village within the Rural Municipality of Caron No. 162, Saskatchewan, Canada. The village had a population of 994 in the Canada 2016 Census, and is located within Census Division 7. 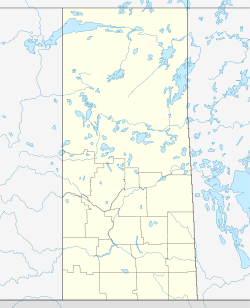 The village is 21 kilometres west of the city of Moose Jaw on the Trans-Canada Highway. As of the 2016 census, Caronport is, by population, the largest official village in Saskatchewan. It is larger than most official towns, the next step up in the municipal hierarchy. It is surrounded by the Rural Municipality of Caron No. 162 which has a smaller population of 576. The student population of Briercrest College and Seminary and residential students at Caronport High School swells the number of inhabitants during the school year (September–April for the college and seminary, and September–June for the high school). The village is named Caronport because prior to being a village, Caronport was a World War II British Commonwealth training base for pilots near the hamlet of Caron, i.e., Caron Airport. The airbase operated from December 17, 1941 to January 14, 1944. Although the runways are now all defunct, the layout of the village was determined by the original runway placement. For more information on the training base see RCAF Station Caron. Briercrest College and Seminary is a private Christian post-secondary educational institution. It consists of a college and a seminary, both of whom offer outstanding Christian education. since 1963, every year in February, Briercrest has hosted a teen youth conference known as Youth Quake. The Caronport High School is a high school within the Christian faith. It offers small class sizes and opportunities for students to participate in athletics and the arts. It is operated by Briercrest College and Seminary and shares many of the same facilities as the college such as cafeteria, gymnasium and chapel. Caronport Elementary is a Kindergarten to Grade 8 school, with an enrollment of about 115 students, and is part of the Prairie South School Division. ^ "2011 Community Profiles". 2011 Canadian Census. Statistics Canada. July 5, 2013. Retrieved 2013-03-16. ^ "2006 Community Profiles". 2006 Canadian Census. Statistics Canada. March 30, 2011. Retrieved 2011-05-01. Brief history of Number 33 Royal Air Force Elementary Flying Training School, Caron, Sask. This page was last edited on 11 June 2018, at 01:59 (UTC).